This is the end of the first section of Phil Metzger’s book on perspective, which is all about atmospheric perspective. This means, colors demonstrate depth. Cooler colors and lighter colors recede, warmer ones move forward. Of course, this is not a hard and fast rule, but one which is generally true. For instance, warm colors become muted with distance and atmosphere. As you can see from this scan, page 25 of Metzger’s book, he demonstrates this principle. While I work in watercolor, he worked this particular study in oils. 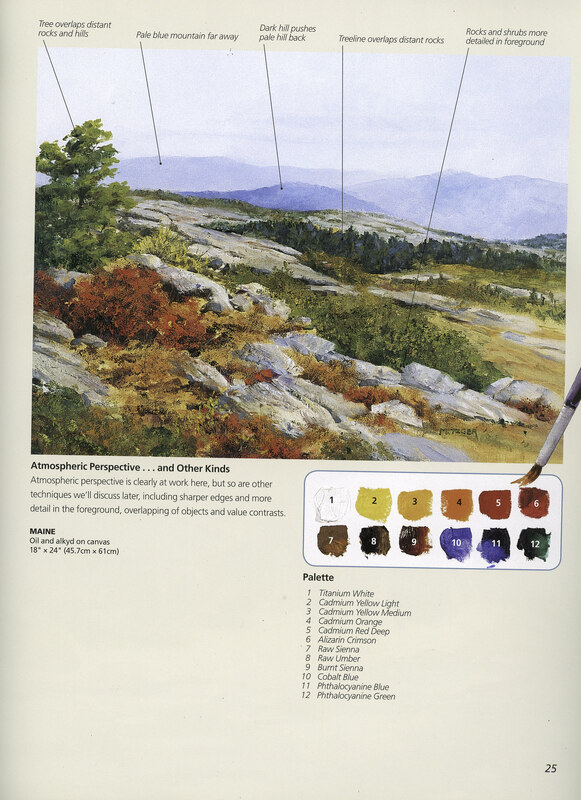 The palette is very close to many palette choices by watercolorists. As you can see from the study, cooler colors are in the distance, and while there are some warmer colors – namely yellows – in the mid-to-distant areas, they are muted. Further distant mountains are paler than ones closer. Pine trees in the distance are blue-green – atmosphere at work. Detail is less in the distance, and greater the closer the painting is the viewer’s eye. The same with colors – warmer to the front. This is my quickie rendition of Metzger’s study. My colors are similar although not the same in all instances. To move the middle ground further away, along with the mountains, I glazed the entire area with a light blue wash; I also did this to unite the areas. The yellows in the midground are dulled with violet as well. The closer I got to the front of the painting, the more pure my colors became. The oranges were sometimes straight from the tube. 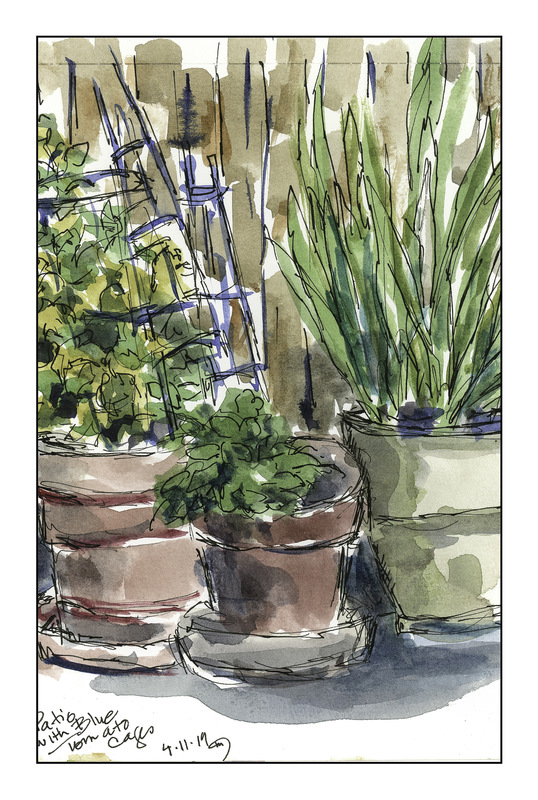 The greens were mixed with yellows – that is green with yellow, green with raw sienna. Oranges and greens were also used. I added detail to the foreground using a rigger brush to create rock cracks and branches. Watercolor is not oil painting, so my techniques were a bit different. Metzger’s book continues to hold my interest. In part it does because it is practical in its approach, beginning with color as that is what most painters “get” immediately. From here, we will be moving on to other elements of painting. I am enjoying the exercises and Metzger’s explanations. There is enough detail to explain, but not so much I am bored or overwhelmed or both. 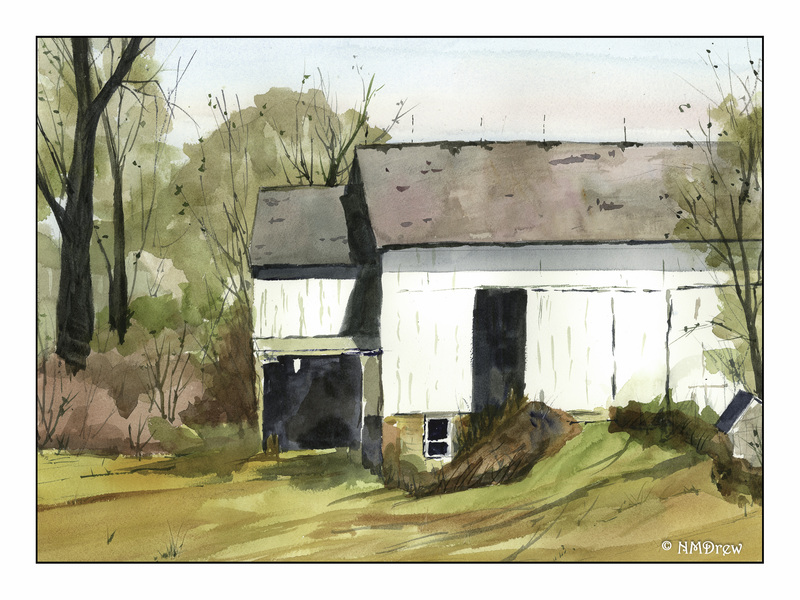 Finally, there is a freedom here – so far I am not doing horrid barns that lack perspective! I have done a lot of those (which shall soon be posted), and am looking forward to the day that my grasp of perspective will be second nature. “Of course!” came my snarky reply. “It’s old. See? There are holes in the barn.” I pointed out the ones on the right, in shadow, under the eaves. Well, I knew there was something wrong, but couldn’t pinpoint it. This morning, I took it out for another look, and just with casual measurement between my fingertips, I found the problem. The right front edge of the roof is shorter than the left edge. The same applies to the right and left sides of the front of the barn. Given the perspective of the painting, it is totally illogical! This was truly a breakthrough moment. I thought I had done the perspective correctly – in many ways I have, as with the road, and such, but the building itself was the problem. 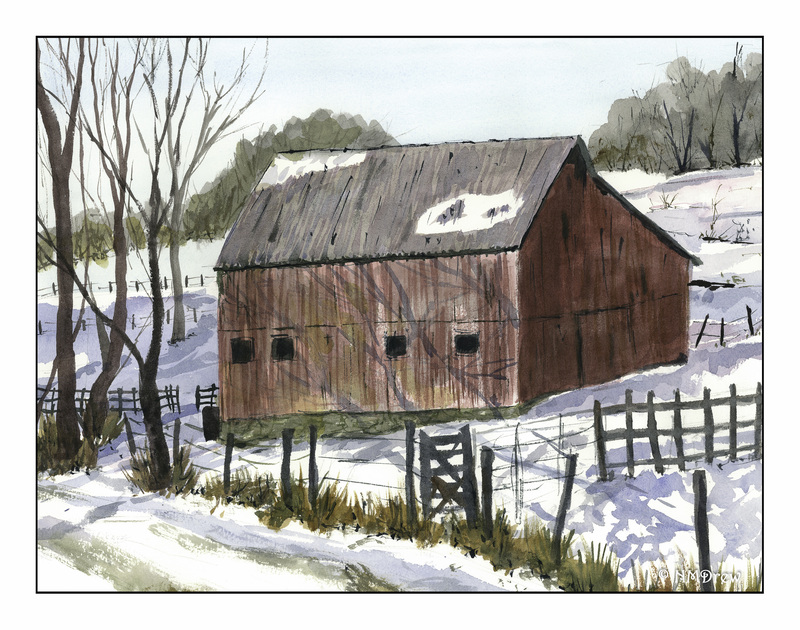 I plan to re-do this painting today, working specifically on the barn roof and walls. Hopefully success will follow! Stay tooned (as my friend Fraggy likes to say!). Nearly everyone I know loves the beach, but there are exceptions. Mostly, they don’t like sand! To me, sand is one of the best parts of the beach. Barefoot, sinking into sand as the tide goes out, walking on warm sand. Watching the sand skitter across the beach with the wind, in lines or swirls. Hearing the waves come in and out, a whisper to a roar. Walking in sand can also be hard work! 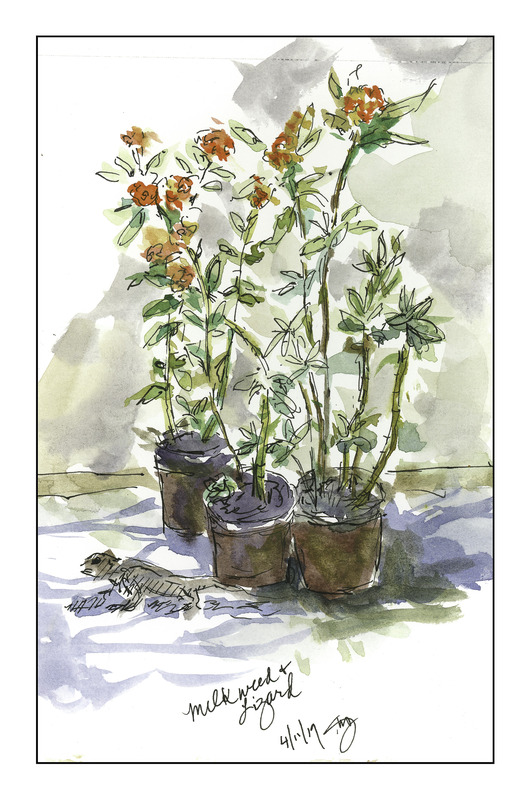 And then, the plants. Grasses, strange sea radishes (that are rather tasty), sea weed and other flotsam. All these make a beach. Time of day gives a beach character – blinding high noon, subtle dawn, fiery sunset. All these add to the experience. Weather, too. Wind, rain, snow. Where you live also adds character to the beach. Northern, southern, tropical. Rocky, cliffs, sand white as snow to black as night Birds, too, and other animals live along the shore. Beaches are magical worlds wherever they are found. 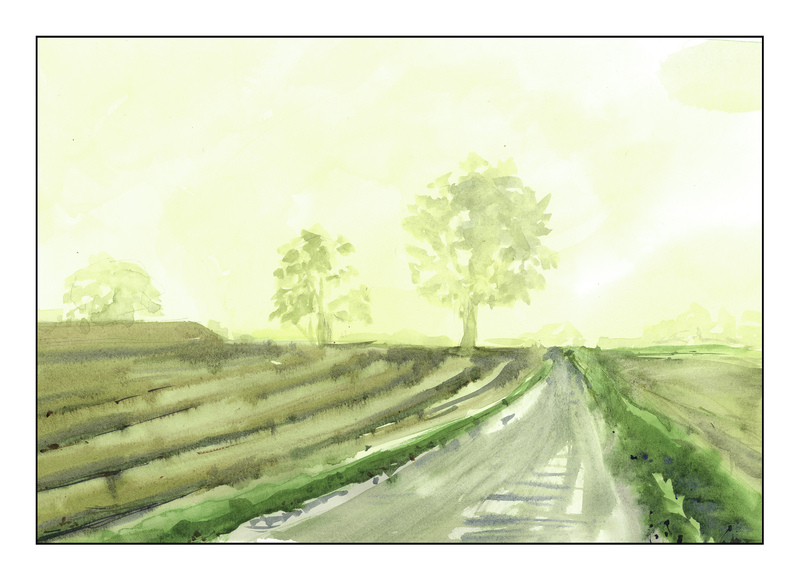 So, we continue with Phil Metzger’s studies on perspective; specifically, atmospheric perspective. As a refresher, atmospheric perspective relies on the use of color for its depiction of depth, near and far. The usual rule is warmer, more intense colors are closer, and the cooler and bluer or greyer colors show distance because of the intervening air – damp or smoggy or both. Weather and climate impact both, as well as altitude. At the beach, there is more moisture in the air, as opposed to the dry air of the high desert. As Metzger points out, the further buildings become, the lighter their colors become, or greyer (if white), and edges less defined. I attempted this below. 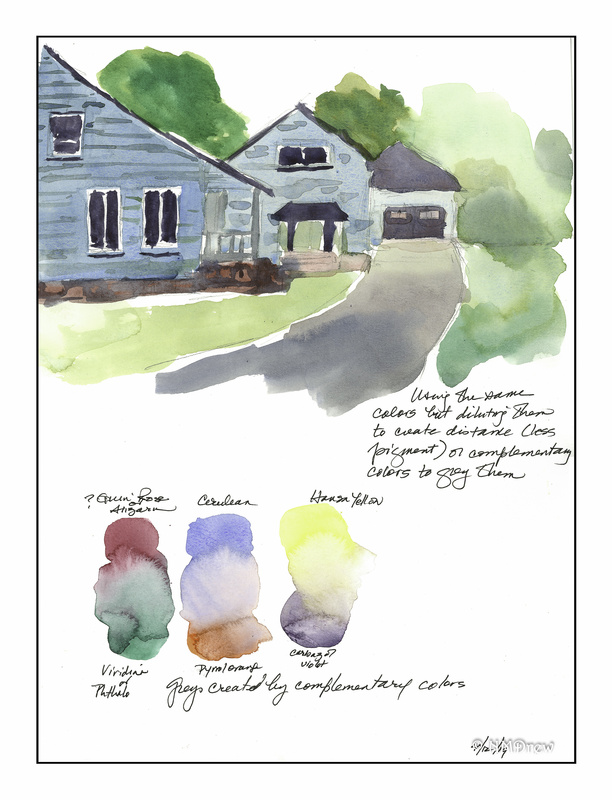 Here, I used the same shade of blue for all three buildings, but to indicate distance, I diluted the watercolor and added a bit of orange to it to create a grey. The same concept was applied to the driveway and to the trees. The greys made by complimentary colors is at the bottom of the sheet. The next lesson was to consider what happens when you do not follow the rules of “warm in front, cool in back” – he gave a sample line drawing and showed what it would look like. I did this – doing something makes it more real than just looking. So, I did it. The upper drawing is more traditional – cool in back, warm in front. It works. However, look at how strange the same image looks with cool in front and warm in back. I used the same colors, but reversed their positions. The bottom one is rather eerie and makes me think of that strange light you get in some storms. Moving on, this idea is brought home on page 23. A photograph at the top shows the classic atmospheric perspective – warm front, cool back. 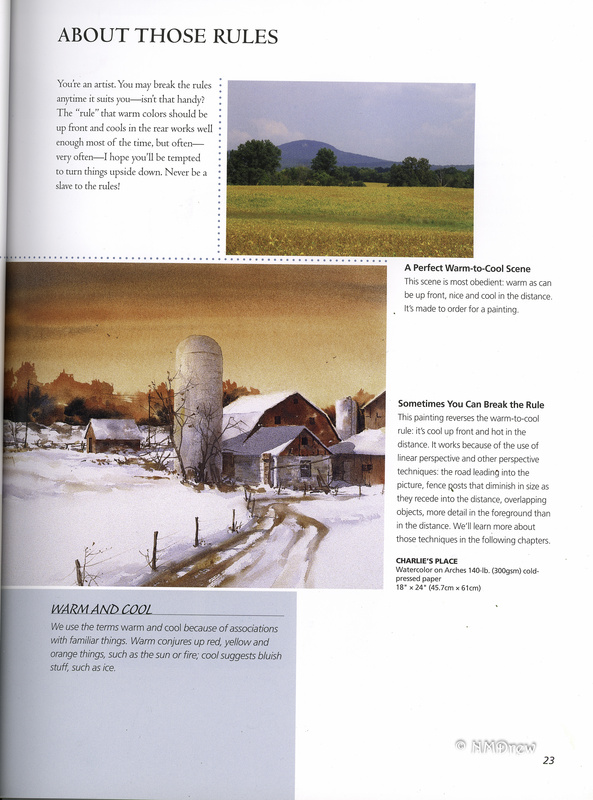 However, the opposite is done in the painting “Charlie’s Place” – warm sky in the distance, warm trees. It’s dawn or sunset – who knows? The warmth becomes cooler toward the bottom edge of the paper. Here, the “rule” is broken, but the painting works. 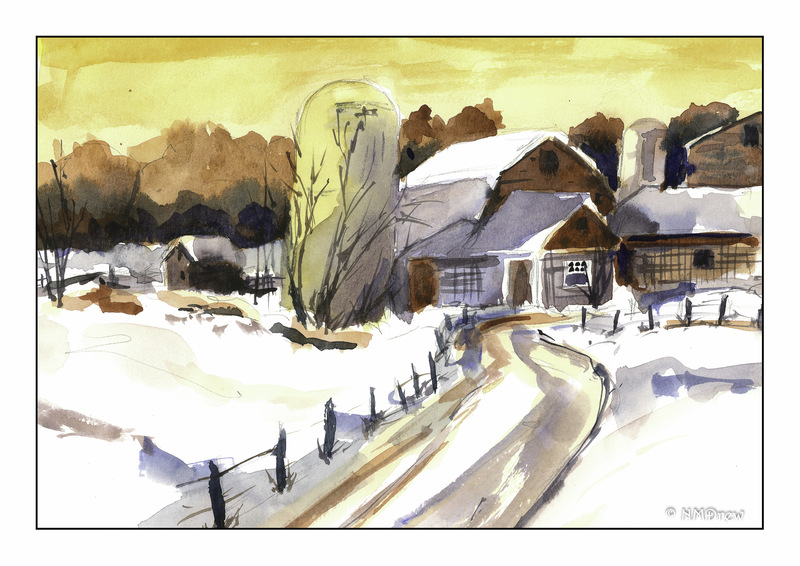 To practice the cool top / warm bottom, as in the photo at the top, I painted a similar image based upon Metzger’s photo. I threw in some birds and added a few verticals, but overall stuck to the idea of the cool sky, bluish mountains, distant greens, and increasingly warm tones to indicate the foreground. 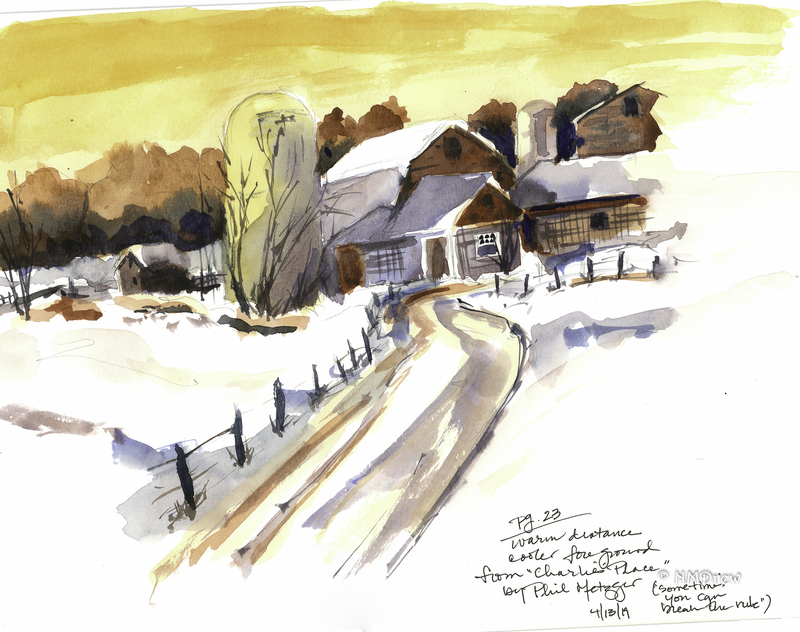 Next is my rendition of “Charlie’s Place” – below, my sketch and notes. This is an excellent study to show you how to break the rules! The cropped image is below, which shows the concept more clearly as there are not any distractions. While the correct sense of depth is not really there – rather flat around the buildings in some ways – the lesson is there. It really does seem to be a rather believable scene. The sky is yellow – we’ve all seen such skies, at sunrise or in the evening. The light is glowing. As we move into the foreground, the colors of oranges give way to blues and greys. To do this, I used Pyrrol Orange and Hansa Yellow for the sky. The more distant trees have Burnt Sienna added; the nearer ones have both Ultramarine and Indathrene blues. These same blues are used to create snow shadows and to make the shadows of the buildings – same orange, yellow, and brown as the background. Greys were made from the blues and orange and used to tone down the buildings in areas, as well as to create the shadows on the snowy rooftops. Perspective in the layout of the road and fence posts add to the illusion of depth. You know, you can read a book and get the idea. I usually do that. However, now that I have time, I am enjoying following the exercises and samples in this book. While these are elementary in many ways at this point, they are very significant. Rules are there and usually work, but doing the reverse also illustrates that rules are to be broken without any ill effect. Practicing painting along with drawing is getting easier, too, and I hope that each exercise adds to my knowledge so that painting becomes more personal and professional at the same time. Day 5 into retirement found me with finally enough time to sit down and start my “class” on perspective. No, not a classroom setting, but rather following the exercises in a book. 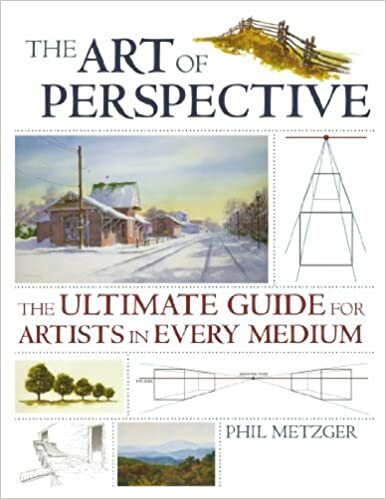 The book is The Art of Perspective: The Ultimate Guide for Artists in Every Medium, by Phil Metzger. As an individual, I found no web pages authored by him, but I did find numerous books which get good reviews. I picked this book up because it dealt with not only the traditional perspective found in drawing and architecture, but the perspective produced by color. 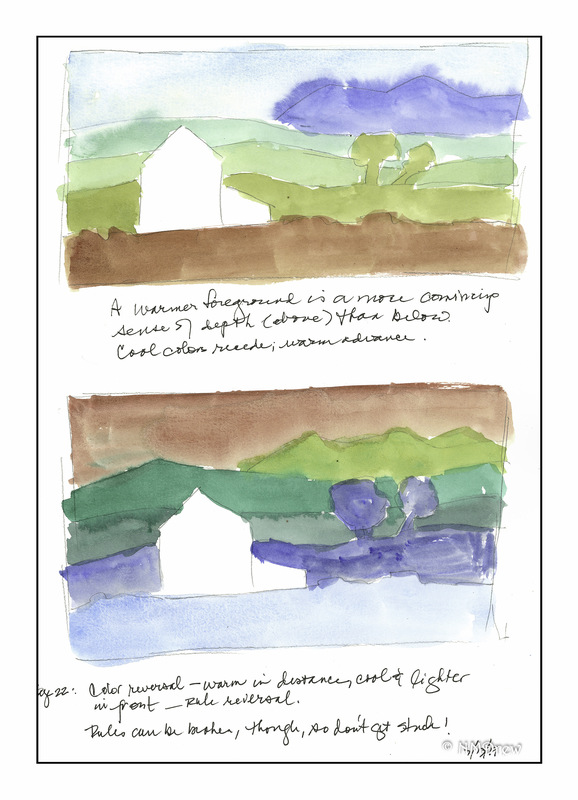 As someone working in watercolor – or anyone working in any medium – color and how to use it is so important. colors become more blue the further they are from the viewer. Mountains are cooler. Bright foliage can create brilliant swaths of color, even at a distance, so this belies the idea of “things become cooler with distance.” They do have less detail with distance. Things are simpler the further away they are – this makes sense of course! Air pollution of cities makes for browner (perhaps) distances rather than bluer. What is important here is to note that edges become more soft and colors, while still colorful, begin to fade. White buildings become greyer unless a brilliant flash of sun is on the building. At times, hills will appear darker than the ones in front or behind them – this could be caused by a cloud passing overhead. Fog softens the landscape or the cityscape. I decided to do a number of paintings. 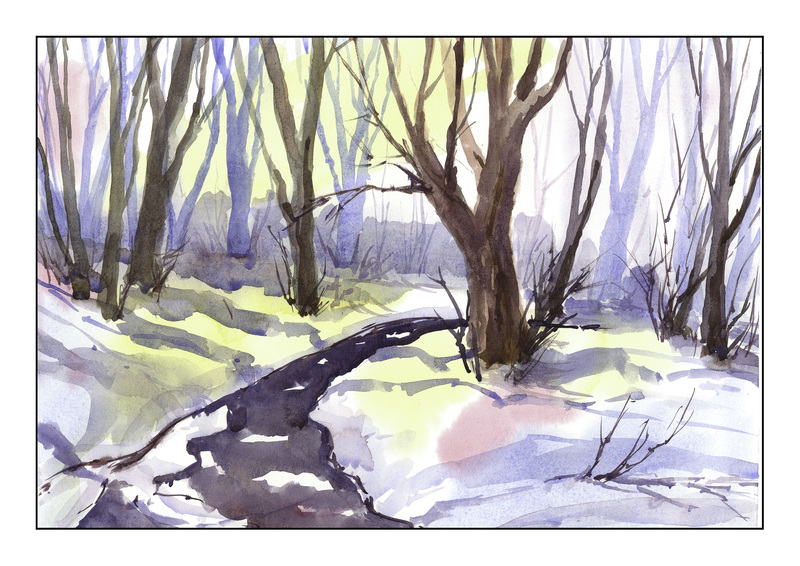 Actually, I figured I would just do the first exercise, on trees, called “Receding Woods” on pages 18-19. This is it below. 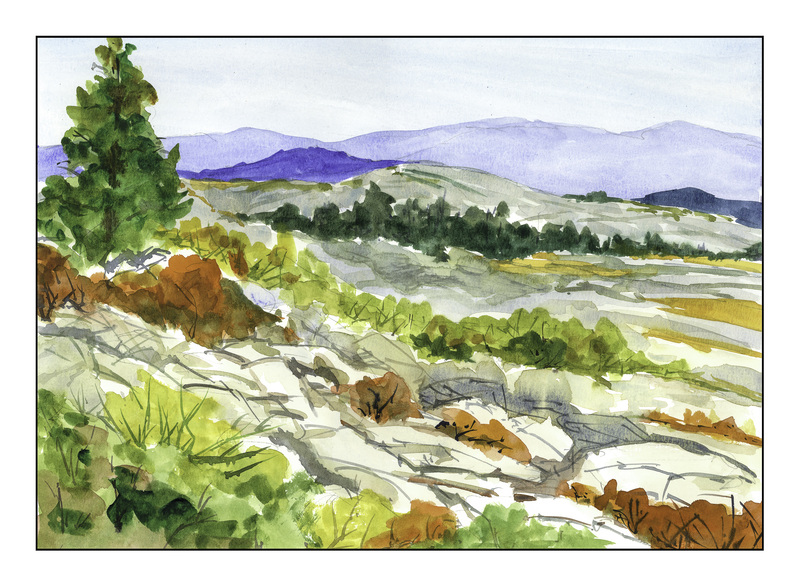 I followed Metzger’s steps – pale wash, distant trees, mid-ground trees, stream, shadows, details. This is the result. I found this to be a frustrating and useful exercise. 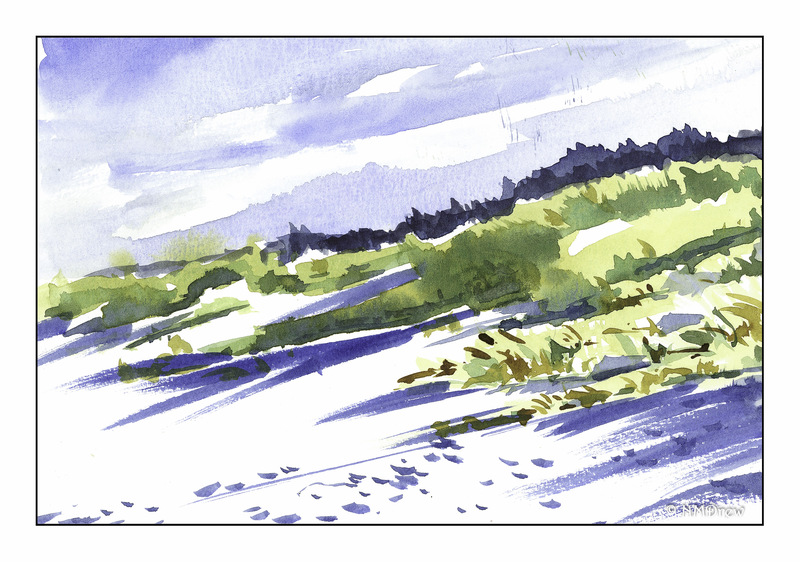 I used the palette he suggested: Alizarin Crimson, Cobalt Blue, Burnt Sienna, Pale Cadmium Yellow. Drop the colors onto wet paper, and move on. 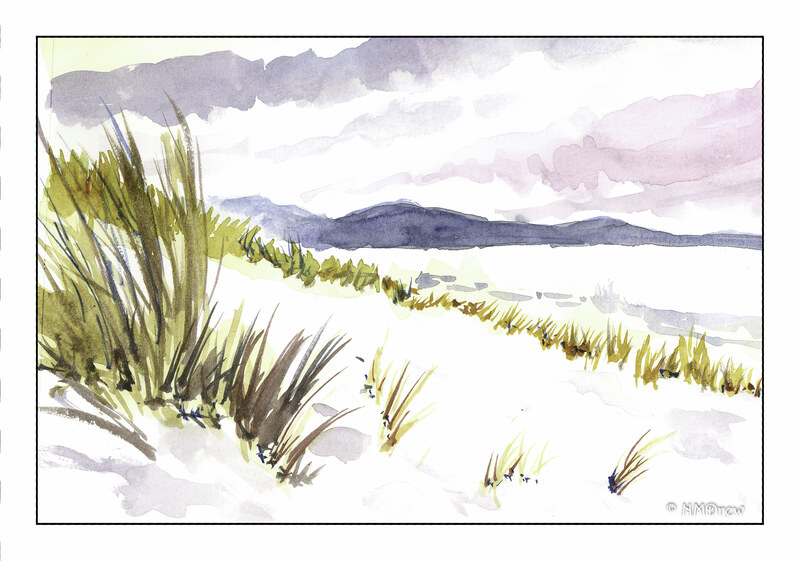 Next step were the pale trees in the background – light blues and browns. From there, darker blue trees to suggest shapes. Mid-ground trees brought in some detail. Finally, the frozen creek and shadows. As a wonderful piece of art, I am not impressed with what I did – but I am impressed with the clarity of Metzger’s writing and example. From this, I decided to go to Pixabay and search for things like fog, barns, marsh, swamp. 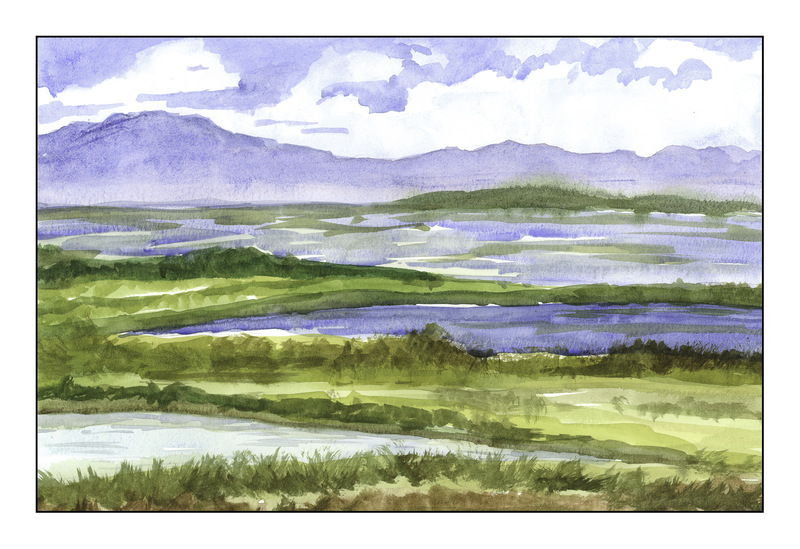 The next study is a marshland. I figured it would be good for water, reflections, and distant mountains. What I liked especially about the picture was the haze at the base of the mountains and the blurred quality of the green hill. In the photo, it was less distinct. From there, I tried to paint the values I saw, so the distant water was a midtone, the middle water dark, and the closest the most pale. I also made the mountains more blue and violet and tried to use warmer colors the closer to the bottom of the page I got. It worked to a degree in varied areas, and not in others. Still, having 3 different values of water was rather interesting. Her is a study on distance and fog. The image was mostly green and yellow in cast, The sun is peeking between the two center trees. The tree shapes show lighter in the painting, as the do in the photo, but I think I could have done a better job with the sky to emphasize this point. To show distance, I tried to make the further objects more simple and cooler, while working at a bit of detail and warmer values for those closer to the viewer. Perspective was indicated by the road narrowing and the curve of the furrowed field. This picture was a challenge! Me, paint a bridge??!! Anyway, a bridge is disappearing into a fog bank; a sail boat sails through the shadow cast by the bridge. The distant bridge vanishes into a thick, white cloud. Detail softens and vanishes. On top of it all, this is a bridge! (I don’t think I would want to drive across it if it were really were in the condition represented by my painting!) Once more, cooler colors and less detail the further from the viewer; more detail closer to the viewer. 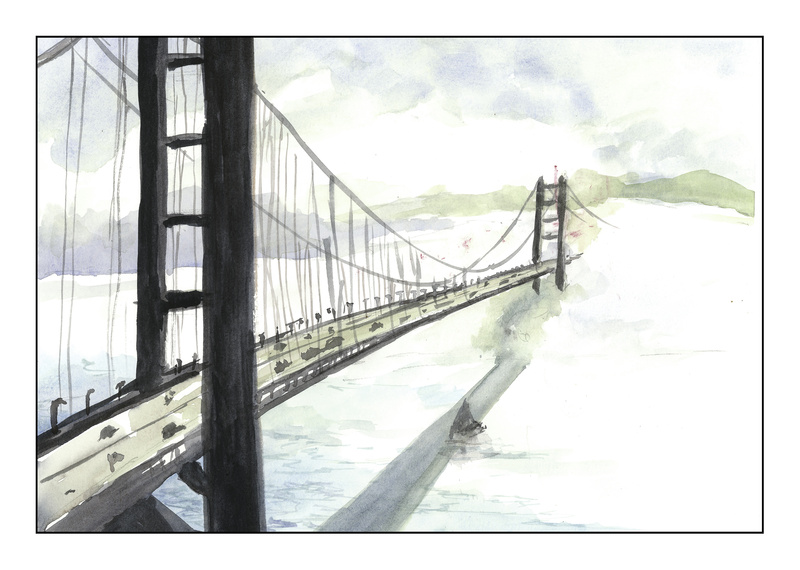 I liked mixing the blues for the water and found out that a rigger brush and a flat brush were my best friends for the bridge. I like this painting a lot more now that I finished it – not a work of art, but a good practice study. This final painting was a serious challenge. 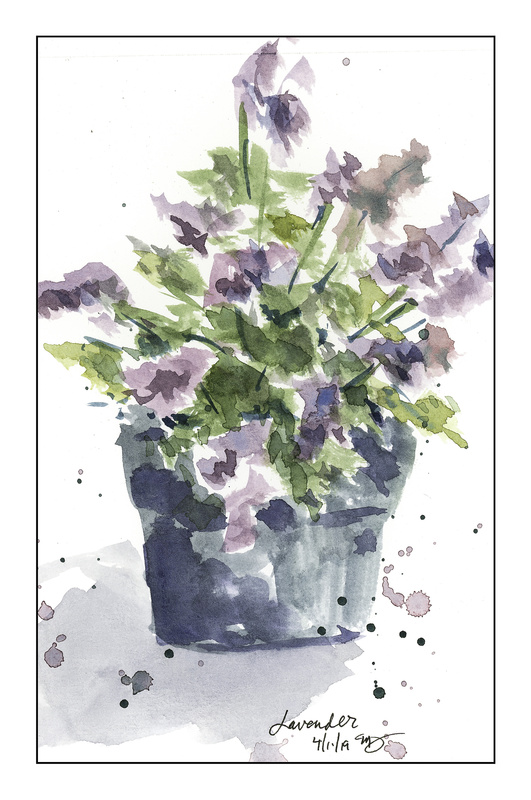 The paper I was using for all of these is student grade, so washes are tricky and often become hard edged or have blooms. I solved a lot of those problems by scumbling along the edges; this was good for softening, blending, and blurring the edges. 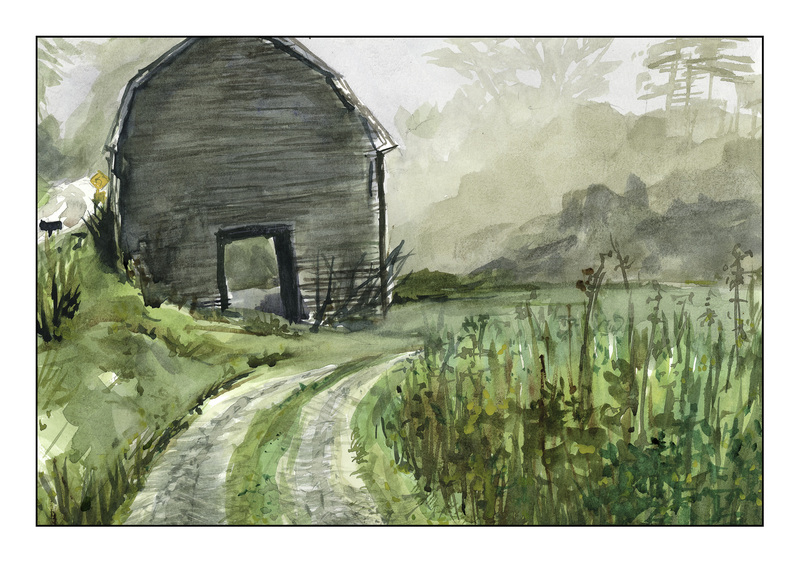 I also used a 1-inch flat brush for the majority of the painting, forming the blurry vegetation, to the barn, to the road. Only when I added detail did I use a small brush, specifically a rigger. While I don’t think this painting has great perspective, the goal of atmospheric perspective was met. I used to the left and right of the barn, as well as with the weed patch on the lower right. As a first exercise for my “class” I really enjoyed myself! I started painting at 9:30 in the morning and only finished around 5:00 pm – time to make dinner. 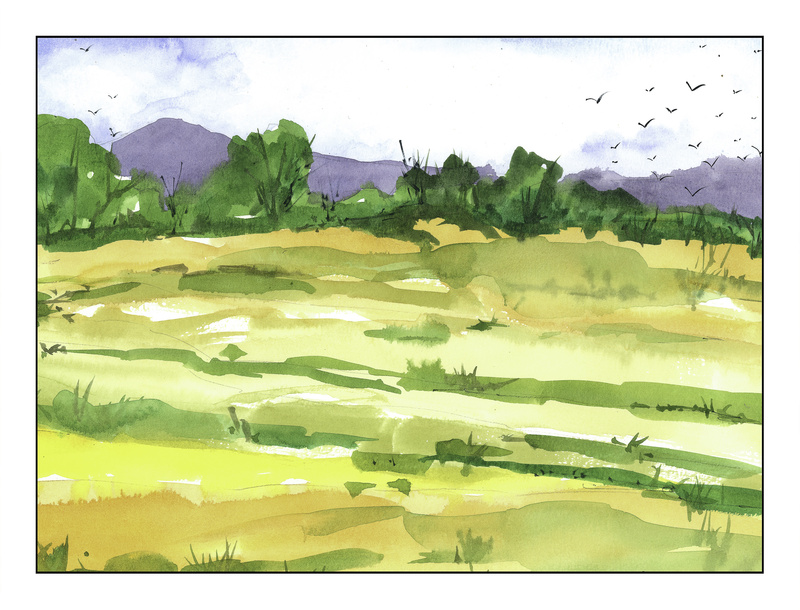 I focused on the atmospheric perspective idea and learned a lot simply by doing. Sure, I know this basic information, but to put it into practice and think about it is a lot different. Experience in the real world is, in my opinion, one of the best teachers, and such studies are invaluable.